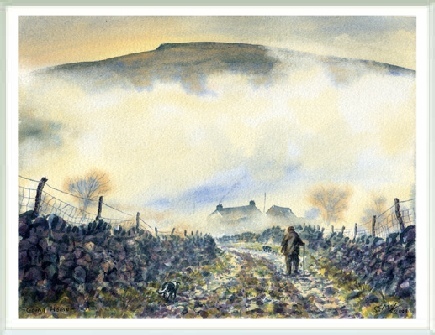 This picture is not so much an attempt to represent a specific place as an atmosphere - that of a cold, late Autumn afternoon on the South Pennines (where I was brought up), as an elderly hill farmer heads homewards with his dogs, weary after a day on the tops. The same scenario replays, with minor variations in detail, throughout all high country where sheep are kept, and the same warm glow of satisfaction accompanies all labour well done, particularly where the work is hard and physical. The prospect of a hot bath and a good supper ahead gives a boost to tired limbs, and memories of wide vistas and soaring skies will refresh the spirits throughout more mundane activities for weeks to come.